In volleyball terminology there are some words that a new comer should be savvy to. Here is a list to help you. One (Set): "A quick set to the middle." 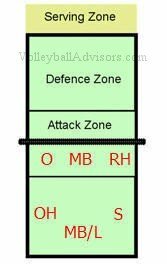 Volleyball Hitting Terms: "One" or "Quick One"
Two Set: A set in the middle of the court usually for the middle hitter to hit. Three Set: A quick set half way between the outside and the middle. Four Set: A set that is 1' to 2' above the net and 1' from the sideline. Five Set: A back set for the right front hitter to play off of. Ten Set: A set to a back row attacker. A ten is also called "setting the pipe." Deep Set: Sometimes a setter will provide a set to be hit away from the net. Trap Set: A low set often very close to the net. Back Set: A set that is performed behind the setter's back for the hitter to spike. Quick Set: A set where the hitter is approaching the setter and may have already jumped before the set is delivered. For this move the setter and hitter must have precise timing. Jump Serve: A serve that is made by the player tossing the ball into the air and then jumping and hitting. Let Serve: A serve that touches the top of the net - and falls into the receiving team's court. Point of Service: A serve that scores a point. Yellow Card: When a player is misbehaving the referee will show them a yellow card and this is a warning. Red Card: The red card comes after the yellow card and it is a severe penalty. A player could be disqualified, the team could lose the serve or lose a point. Service Error: A very unsuccessful serve. Reception Error: A serve that the opposing team should have been able to play off of but that instead results in an ace. Held Ball: A ball that stops moving during contact with a player. This causes a foul. Screening: A sneaky attempt to obstruct the opponent's line of sight while a teammate begins to serve the ball. This is not allowed. "Center Line Violation or Being a Tuna?" Center Line Violation: If a player steps under the net out of his side of the court this is a center line violation. Antenna: The rods that are attached to the edges of the net directly above the sidelines. They are usually colored white and red. Center Line: The boundary that separates the court into two halves and is drawn directly under the net. Back (Court): The area form the attack line to the end line. It is called Defense Zone officially. We all usually talk about Back Row. Front (Court): Called Attack Zone officially. Usually called Front Row. Free Zone: This is the space outside the boundaries of the court. Players can still keep the ball in motion within this zone. Attack Zone: The area between the net and 10 feet (3 meter) line. Defense Zone: The area between the 10 feet (3 meter) line and back line. Serving Zone: The court wide area behind the back line, which servers can use to put the ball in play. You may find it called Service Zone in the rule book.